If you’re hoping for evidence of life on alien planets, this has been a very good year—and you didn’t even have to look beyond our solar system. In 2018, researchers found organic material on Mars, hinting that the building blocks for life underwent at least some assembly at the Red Planet. Also making headlines: A recurring pattern in Mars' atmosphere, suggestive that methane-breathing microbes might wax and wane with the Martian seasons. After that came word of the first substantial liquid water ever identified on Mars, sloshing in a giant lake under the southern polar cap. Farther away, researchers think they spotted Jupiter's icy moon Europa spewing plumes of material from a colossal, underground ocean that may harbor life. In June, researchers also announced the first detection of complex organic material in the plumes from another moon, Saturn's Enceladus, again pointing to the possibilities of alien life oh-so-close to Earth. Over the next decade, researchers will gather vital new clues as another round of robotic missions explore Mars and a spacecraft sweeps by Europa to sample its plume for signs of biology. Are we on the brink of proving life exists elsewhere? The Kavli Foundation assembled a roundtable of experts in the field of astrobiology, which delves into the origins of life. They had a wide-ranging discussion about Mars, icy moons and how these major discoveries are changing the search for biology beyond Earth. SUKRIT RANJAN – a post-doctoral researcher in the Earth, Atmospheric and Planetary Sciences department at the Massachusetts Institute of Technology (MIT) and an affiliated member of the MIT Kavli Institute for Astrophysics and Space Research. His research focuses on the origins of life from non-living chemistry. MORGAN CABLE – a technologist at the NASA Jet Propulsion Laboratory, California Institute of Technology, who works on instruments for spacecraft missions. She also served as the Assistant Project Science Systems Engineer for the Cassini Mission, which studied Saturn and its moons for 13 years until 2017. ANDREW STEELE – a staff scientist in the Geophysical Laboratory at the Carnegie Institution of Science. He is a co-author of a recent paper describing the complex organic material uncovered at Mars. Steele's expertise is in the detection of microbial life, which scientists agree is by far the likeliest sort that might emerge elsewhere in the universe. ​​THE KAVLI FOUNDATION: There’s been incredible news this year about the prospect of life in our solar system. Let's cut to the chase: Beyond Earth, which planet or moon does each of you believe has the best possibility of harboring life? SUKRIT RANJAN: My answer has changed recently to Mars. The surface of Mars is really hostile. But there's evidence of liquid water that could harbor life in the deep subsurface, like in that recently discovered underground lake. Couple that with evidence that early Mars seems to have been very similar to early Earth. If life happened here, then why couldn't it have reasonably happened on Mars? We also have the recent detection of seasonal methane, which I know we'll discuss further. It's not a slam dunk that this methane is a sign of life, but it has made me start to think more and more about life as a possible explanation. Sukrit Ranjan studies the origin of life from non-living chemistry at MIT. MORGAN CABLE: Going from lowest to highest odds, my three choices are Saturn’s moon Titan, then Jupiter’s moon Europa, then back to Saturn and its moon Enceladus. Titan has an internal liquid-water ocean and all this fascinating chemistry with complex organic molecules raining down on its surface. If there are plate tectonics on Titan like we have on Earth, they might provide a way for organic molecules on the surface to get down into that liquid-water ocean. There, organisms would have everything they need to survive. The problem is, Titan has a pretty thick crust of water ice, so it's not clear how those molecules would get underneath it. Number two on my list is Europa. It also has an internal ocean. We now think it has plumes, through which we may have an exchange of molecules between the surface and interior, similar to what I just mentioned on Titan. Where Europa’s ocean meets its shell of water ice, you could have life-supporting chemistry. But my number one is Enceladus. That's the only place in the solar system where we’ve confirmed there are active plumes—geysers shooting water into space that not only contain water, methane and hydrogen, but also complex organic molecules. Enceladus likely has all the ingredients for life. Plus, it's also one of the few places where we may be able to go and access a plume directly. By doing so, we may be able to answer the question about the existence of life elsewhere in the universe, once and for all. ANDREW STEELE: For me, the likeliest places for life are also those icy moons of Jupiter and Saturn. They're very active and dynamic, which you would need to push from non-living to living chemistry. I don't think Mars has been that active a place. But Mars is great for testing these theories on a planet that we think has hiccupped partway toward life. TKF: Let's talk a bit more about Mars. It’s really having its moment. Andrew, you are part of a team that reported the seasonal variation of methane in the Martian atmosphere that Sukrit referred to earlier. Why is that seasonality important? STEELE: Those observations show Mars is "breathing." There is a cycle. The question is, why? Is Mars dead, in which case it is just breathing geochemically, or is it breathing because there is life? You can’t conclude it’s a sign of life until you've crossed off every other possibility. RANJAN: Normally, methane should break down chemically after a few hundred years, so you wouldn’t expect it to return to the atmosphere when seasons change. The fact that methane is returning on time scales of several months implies something really weird is going on with the atmosphere, or maybe that life is playing a role. This discovery has raised a lot of major questions. Morgan Cable works on instruments for spacecraft missions at NASA's Jet Propulsion Laboratory. TKF: Andrew, you also worked on another study reporting that the Curiosity rover detected complex organic molecules preserved in 3-billion-year-old sediments on Mars. Two questions for each of you: Why are these sorts of molecules so intriguing, and what does this tell us about Mars that we didn't know before? STEELE: The findings show us that there is an active process removing carbon from the environment on Mars and putting in into complex molecules, and that is a step forward for the possibility of life that we didn't have before. RANJAN: Just a caveat here. We have to be careful what we mean when we say complex organics because if you have a source of energy plus the elements carbon, hydrogen, oxygen, stuff like that, you expect some organic chemistry to happen. What's really interesting is the kind of organic molecules you get. There are certain kinds that non-living sources are really good at making, and you get them all the time. There are others that non-living sources are really bad at making, things like nucleotides, which are the building blocks for RNA and DNA. If you're finding nucleotides, then that's starting to sound much more appealing. STEELE: Sukrit's right, the formation of complex organics is not that surprising, and we're not seeing anything as complex as nucleotides on Mars. But where we are gaining ground is that complex organics are also an energy source. My previous research shows that Mars rocks are really very habitable. They're a basalt, similar to the rock we have from the volcanoes at Hawaii or Mount Etna in Italy. Creatures love basalts because they offer a lot of nutrients. At Mars, we’re starting to set a baseline of the non-living chemistry. As a result, we can look for deviations from that baseline for hints about the presence of life, without having to make assumptions that life would work exactly as it does on Earth. We have to understand the chemistry of Mars as it is, not just how we usually see it on Earth. CABLE: Andrew, do you think this sort of line of inquiry could also be applied as we start to investigate places like Europa and Enceladus? STEELE: Yes, absolutely. I think we should be looking to set those baseline values for our continued exploration of icy moons. Andrew Steele's research focuses on the detection of microbial life. He works at the Carnegie Institution of Science. TKF: Let's jump farther out into our solar system to those moons. Morgan—you worked on the Cassini Mission, which wrapped up its 13-year exploration of Saturn and its moons last year. Cassini famously detected the plumes of material streaming off Saturn's icy moon Enceladus, with an exclamation mark coming just this summer when the plumes were announced to hold complex organic material. Why are these findings so important? 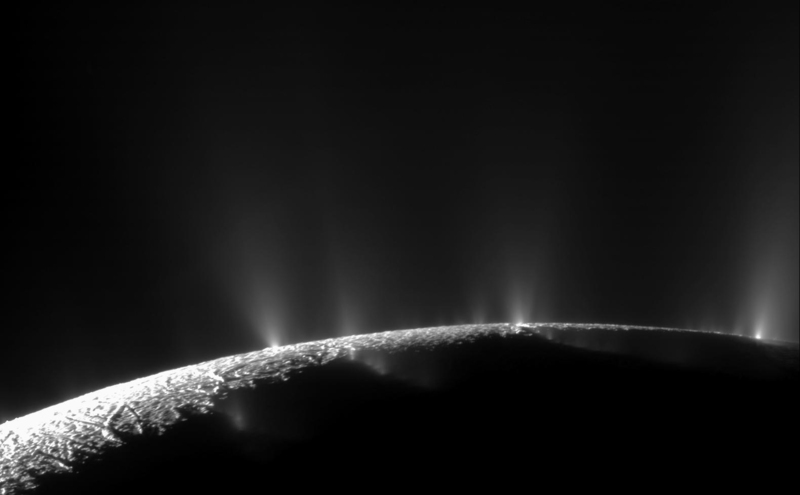 CABLE: This study analyzed grains of ice coming out of the Enceladus plume. Most of the grains are pure water ice, and some are very rich in salts. But a subset, about 3 percent of them, are very rich in organics. Unfortunately, it's tough to make any definitive conclusions about them because the instrument that measured the grains is outdated—remember, Cassini launched in 1997. So while we can't say that any of the Cassini instruments confirmed outright biomolecules, they did show a lot of rich chemistry. That points to things life could use, such as chemical building blocks and food. These findings tell us that Enceladus is a place we need to go back to with more modern, sophisticated instruments. TKF: Morgan, you're also working on NASA's next mission to Europa, called the Europa Clipper. Just this past spring, new data suggested Jupiter’s moon Europa also expels plumes of material into space, though there is some doubt about the findings. Assuming the discovery holds up, how do these plumes affect the Clipper mission and its goals? CABLE: Gauging the habitability of Europa is one of the major scientific goals of the Clipper mission. In the same approach we took with Cassini, the Europa Clipper will have instruments called mass spectrometers. You can think of mass spectrometers like tongues sticking out and tasting the stuff that's in space. If there is a plume putting material into space, then we may have a mechanism of "tasting" and studying what is inside Europa. Now, the Europan ice shell is a lot thicker than the shell on Enceladus, so it's not clear if the Europan plumes are actually coming from the moon's internal ocean or from some other liquid reservoir closer to the surface. Either one is a really fascinating prospect! RANJAN: I'm really excited this work is being done. The more we know about these planets and moons, the better we can understand how life started on Earth, and if it might be a rarer phenomenon than we hope. STEELE: I'm also really excited by the journey. We can’t predict how long it will go on or what it will ultimately bring us, but it's important to undertake and learn from that data in as many ways as we possibly can. "The more we know about these planets and moons, the better we can understand how life started on Earth, and if it might be a rarer phenomenon than we hope." TKF: You mention better understanding life's emergence on Earth. Have we even come close to answering the question of how life got going here? Sukrit, your research focuses on life's origins. RANJAN: That's a really good question. It's hard to say how far we’ve gone toward answering it because we have no other examples of life. It's as if we're walking down a road, and we're not sure when that road will end. But we do know where we want to end up. We want to get to some kind of self-replicating chemical system capable of Darwinian evolution. Scientists are exploring a number of different roads to get to that destination, though none has been fully successful yet. For example, I’m really interested in the “RNA world hypothesis”—the idea that the DNA and proteins integral to life started with another complex molecule, RNA, that's easier to arrive at chemically. So far in the lab, we haven’t been able to build something even as relatively simple as RNA. There's still a lot of work that remains to be done. STEELE: You can think of this drive toward life as simply putting 100,000 test tubes on a lab bench. In test tube one, you start with a simple carbon and oxygen compound. In the other test tubes, you keep adding more carbon, oxygen, hydrogen and other ingredients for life. By the last tube, there's a microbe swimming around. The chemical reactions that need to happen in between to join those molecules together to eventually make sugars, DNA and so on, require constant movement, constant energy, constant recycling of reactants and products, as well as other conditions. CABLE: The more data that we have to throw at the problem, the better our conclusions will be. In that respect, having access to datasets from Mars and these icy moons, whether they have life or not, may provide ideas about what chemical pathways could ultimately lead to life. TKF: Outside the solar system, astronomers have already discovered thousands of exoplanets, some of which are close enough that we can study them for signs of life. How important is it to get a good handle on our own solar system in order to evaluate other solar systems' planets and moons for life? STEELE: Understanding our own solar system is sort of like having a Rosetta Stone with which to make sense of what we're seeing elsewhere. When we look at exoplanets, we’re looking for light signatures in their atmospheres indicating the presence of gases that could only be produced by life. Because we're viewing exoplanets from very far away, we have limited data for drawing these sorts of inferences. Similarly, if aliens on an exoplanet were looking at our solar system, they'd likely be hard-pressed to find life on Earth. So it's critical that we make progress in learning what signs of life can look like. RANJAN: That's right. We're getting so little signal from exoplanets that interpreting whether or not they host life will be difficult. That’s why I agree we really need to know our solar system. On the flip side, I also think there is an opportunity for exoplanets to help us interpret our solar system’s worlds. There are so many more exoplanets than what we have here, of course, and they're also so diverse. CABLE: Life should be the hypothesis of last resort. You should have eliminated all other possible explanations for the data you see to arrive at life as the only answer, and it's hard to do that by looking through telescopes at the light signatures of exoplanets. It would be much better to send spacecraft and collect data right from the planet's surface, but even that poses problems. In the late 1970s, we landed the Viking probes on Mars. A life-detection experiment that ran on Viking gave a highly ambiguous answer. The results are still debated today, with some scientists arguing that we've already found evidence for life on Mars. So the lesson we're taking as we design experiments to search for life on Enceladus, Europa, Titan or anywhere else is to make sure that we reduce this ambiguity. We want our tests to give us a definitive answer. Yet the more we find weird types of exoplanets, and the more we find weird chemistry in our own solar system, the more it complicates how we do these experiments. Ultimately, we can't expect to have a slam dunk right away. TKF: A last question: Is there good reason to speculate that life might not be "as we know it," that it comes in forms we would scarcely recognize? Morgan, you have done research on whether exotic life could use a solvent other than water for its biochemistry. CABLE: The more discoveries we make, the more we realize that any assumptions we make could be wrong. I don't think any one of us would exclude the possibility that some other liquid, such as ammonia, methane, ethane or even a liquid form of carbon dioxide, could work as a potential solvent for life. But these liquids are going to behave differently than water. As a result, life in these liquids would have to be fundamentally different than life that could exist in liquid water. It doesn't mean that this alien life wouldn't use the same, abundant, basic building blocks of carbon, hydrogen, nitrogen and oxygen. But it may put them together in different ways. As we search for life in all of these different environments, I think the best thing that we can do is try to be as agnostic as possible. What I mean is, instead of looking for a particular molecule associated with life as we know it, we should look for patterns in the chemistry we find instead that simply could not be produced without life. RANJAN: Our best chances of detecting life as we don't know it are within our solar system. That’s because we are limited in what we could conclude about exoplanets and exomoons without actually visiting them. Making a claim of life would be extraordinary on its own, so a claim of life using a solvent other than water would be difficult to prove convincingly. STEELE: At some point, you have to scientifically, as well as philosophically, consider what is "life," anyway? We can't even decide if viruses fit into the definition. The line between life and non-life can get very, very blurry. I think you have to start with what you know as life, and make sure that you don't miss it, but also keep a completely open mind.